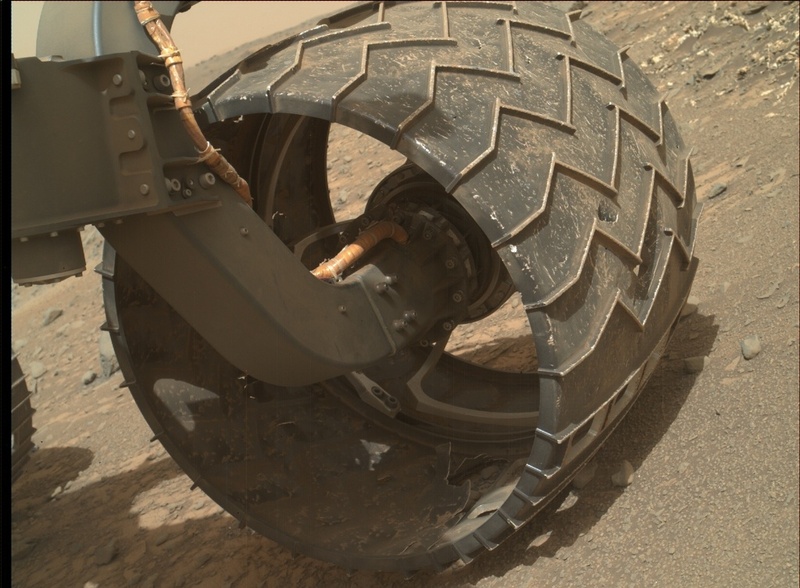 Meanwhile, over on the other side of Mars ... the Curiosity rover is doing a tire self-examination. You may recall that the mission planners were getting worried about the unexpectedly high rate of tire damage – and photos like this one show why, graphically. Those aluminum tires look like the losers in a rough fight. In the photo at right (click to embiggen) you can see several badly damaged parts on one of the rover's six tires. The mission planners are driving carefully these days, most especially to avoid any particularly sharp or jagged rocks. Let's hope this caution keeps Curiosity mobile long enough to explore Mt. Sharp!